Franjo and Bara Salopek of Duquesne, PA are seated next to the bride and groom in this photo. I am always excited when someone identifies a face in one of the Croatian Marriage photos posted on this site! 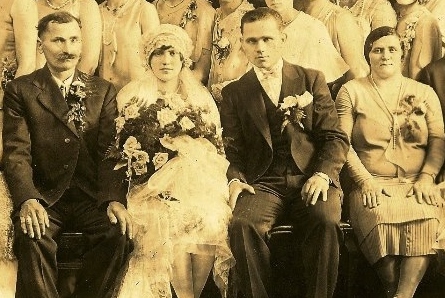 Recently Mary Ann was able to identify her grandfather, Franjo Salopek, as the man with a mustache seated next to the bride in the photo above. I am quite certain that his wife Bara is the woman seated on the right, next to the groom. This is especially exciting to me, because the bride and groom happen to be my grandparents! Franjo was born 15 June 1878 in Ogulin, Croatia. He was previously married to a woman named Anna until her death in 1917. The couple had five children: Tomo, Mijo, Anton, Josip, and Mate. A photo of their son Tom’s marriage to Cecelia Machek is also included on the Croatian Marriages page. Franjo and his second wife Bara had four children: Mary, Manda, Agnes and John. According to the 1930 and 1940 United States Census records, the couple resided below the tracks at 28 Superior Street, Duquesne. After the steel mill expansion in 1941 they resided at 218 North 1st Street, Duquesne – next door to my grandparents! Thank you, Mary Ann! Love UR blog ! Got here from Duquesne Hunky blog. I am trying to sort out family tree. My grandmother was Magdalena Salopek from Salopek Selo and my grandfather was Nikola Vucetic from Ogulin, Croatia. We visited an Aunt Cil and Uncle Tommy in McKeesport, funerals in Duquesne and visits there when we were young. Also, there were 2 dead mutes who lived in the same house (where we met many relatives) who later married and had a son. We were too young to take it all in. We had some hilarious times with all of them ! I don’t have names, tho many were talked about with Aunt Cil and some names are familiar. I saw a wedding photo of Aunt Cil and Uncle Tom on one of these sites or blogs. My dad and all Uncles and Aunts are dead and none would talk even when alive ! My best to you ! I am 70 yrs here and live in Maine. I drove to Prudhoe Bay in a rental car ! Ha ha. What are the names of the Bride and Groom ? Also correction to previous post – I meant “deaf mutes” – not “dead mutes”.